Explore Tokyo's fun side and experience hidden Izakaya bars with a local well-known guide during your 2.5-hour pub tour. Izakaya is the term for a Japanese-style pub where people go after work for casual drinking. Catch the train (own expense) to some of Tokyo's nicest izakaya pubs and enjoy your evening like a local. Your guide will translate the menus and help you to choose tasty food and drinks at each pub (own expense). Your small-group tour is limited to 12 people, ensuring a personalized experience. Come see and taste Tokyo through the eyes of a true local. 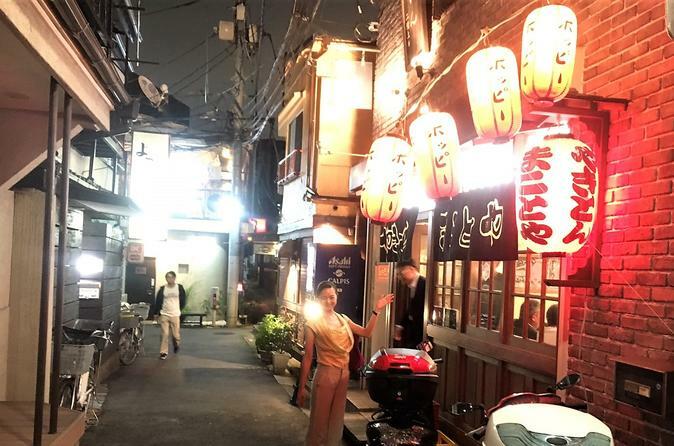 Your tour will take you on a very unique off-the-beaten track street-bar-hopping and izakaya experience where you will enjoy a very colorful and eye-opening local night of culture away from the commercial and mainstream pubs often frequented by tourists. Choose the pubs you want to visit on your 2.5-hour bar hopping tour. Meet your well-known local guide at a nearby train station and make your way to the first izakaya bar for an appetizer. After a short walk around the neighborhood you will arrive at your next izakaya. Again your guide will read the menu for you and translate to make sure you will enjoy the meal and food cultures of Tokyo. At the local izakaya, Yakitori, Okonomiyaki, Sashimi and Oden handmade dishes will satisfy your taste buds. If the timing is right, you will head to the last izakaya bar. Even though the pub is private, your local guide can gain entrance. At the end of your tour, your guide will help you with directions to get back to your starting location, or lead you to the nearest station.